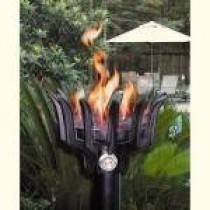 Remote Control Automated Gas Tiki Torches provide a source of ambient lighting in your backyard design, adding atmosphere to an already relaxing environment. But they are much more than just a way to see the darker edges of your backyard. 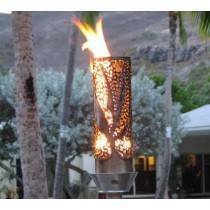 They are an element that can give the feel of an island oasis in your own landscaping design.At Outdoor Fire and Patio, you can trust our dedication to quality. 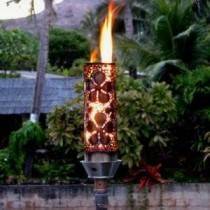 Our custom gas tiki torches are made of the best and most reliable materials to assure years of enjoyment. 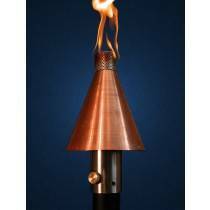 Our Automated Gas Tiki Torches use a 24-volt wiring system for safe, easy installation. 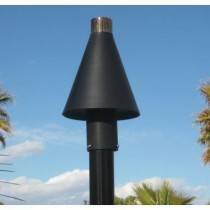 Expect dependability from our 96-inch high design, with a durable 2 1/2-inch diameter steel pole. 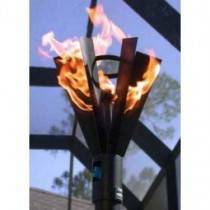 They stand up to the test of inclement weather, meaning you never have to worry about rain, snow, wind, or other damage to your automated Gas tiki torches. 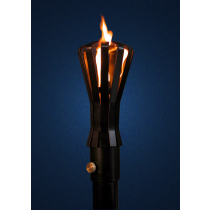 Tomorrow's Technology Today - Our Automated Remote Control System is rated safe for all weather and provides a convenient, reliable way to operate your tiki torches and other outdoor fire features. 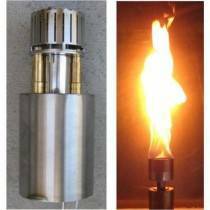 The simple push of a button turns the check valve on your gas tiki torches on and off, regardless of how many different Fire Features are linked to the automated controls. Take advantage of Outdoor Fire and Patio's desire to provide the latest technology, making it easier for you to enjoy your outdoor oasis on any occasion in any weather!